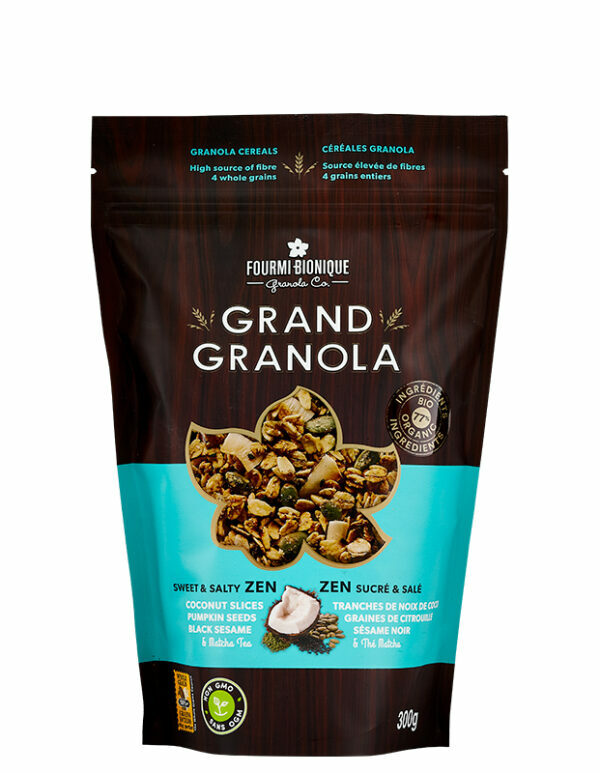 The Grand Granola Zen is a granola blend offering a perfect balance of sweet and salty notes, to which have been added pumpkin seeds, black sesame seeds, Matcha tea and crunchy toasted and salted organic coconut slices. You can enjoy this granola blend at any time of day, especially when hesitating between a salty or sweet snack… and why not both at the same time? As a topping over a dense and rich natural yogurt, it is a real treat which you will quickly be addicted to. For more inspiration, discover our original recipes. This product is certified by Ecocert Canada for its organic ingredients, Kosher Pareve by COR, and Whole Grains by the Whole Grain Council. 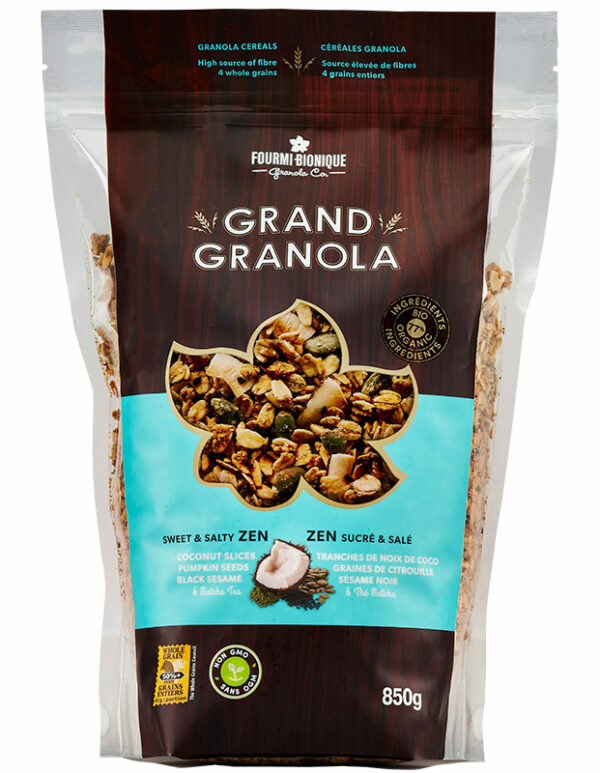 The Grand Granola Zen is also available in an economic and recyclable bulk packaging. It is also offered in the NUTBROWN grain-free and gluten free granola range. Rolled oats*°, Sugars (honey°, cane sugar*), Whole spelt flour*°, Sunflower oil and/or Canola oil, Toasted and salted coconut slices*, Rolled rye*°, Rolled barley*°, Pumpkin seeds, Oat bran*°, Coconut*, Black sesame seeds, Sea salt, Matcha tea, Natural flavour. May contain almonds, cashews, macadamia nuts, hazelnuts, pecans, milk, wheat, soy and ingredients made in a facility that processes peanuts. The crunch of the lightly salted coconut merges with the toasted sweet & salty oats, dressed-up in the seeds of Japanese inspiration. Balanced and strong, like a symphony of comforting colors chanting the arrival of a new day.